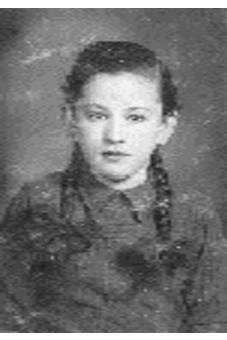 Gavriella, 12 years old, one of more than 1.5 million Jewish children who perished at the hands of the Nazis and their many accomplices. A faded photograph, a memory....not to be forgotten. Today is Holocaust Memorial Day, or more accurately, in Hebrew Yom Ha Shoa ve ha Gevurah, the Day of Calamity and Bravery. For it is not only to remember those who perished, in the gas chambers, in the forests, and in every cruel method known to man, but also to remember the great bravery, both spiritual and physical. It is to remember the Jew who traded his last piece of bread for five minutes to use a prayer book, it is to remember a mother who rather than escape alone marched proudly with her little children to the gas chambers so that they, in their last moments, should not feel abandoned, it is to remember those who fled to the forests and took up arms against the Nazis. It is to remember them all. Just a few minutes ago I was walking out of the Maaleh Adumim shopping mall when the siren went off. As is well known all of Israel comes to a halt and stands in silent memory for two full minutes. The security guards, the shoppers, everyone stood still. Cars stopped and the drivers got out, stood next to their cars with the doors still ajar. Young and old, religious and secular, with head coverings and in jeans, they all stood. I looked at everyone as I thought of the countless precious people we lost. That moment is always difficult, what do you focus on? The image of the little boy in the Warsaw ghetto, his hands held up as he faces a German soldier? or a family member that I never knew? Uncle Bumi my grandfathers' brother? or the ten siblings of my great grandfather Shmuel, none of whom survived? his 96 year old mother who died on the train to Auschwitz as she saw her children and grandchildren taken away? Whom? Today I thought of a little girl whom I just "met". All I know is her name was Gavriella and she is the aunt of my dear friends here in Maaleh Adumim. I think of her now, a sweet 12 year girl with braids, and a full life ahead of her. She is honored and remembered and a young girl in Israel is named for her. New life. But I also looked at all the people around me. Some were dark, Jews from Arab lands, some were light, Jews from Poland and Russia. Some were no doubt thinking of lost relatives while others were just honoring the memory of a nation. A friend of mine, a Jew from Yemen, told me just this past week how his entire life was profoundly changed by his visit to Poland, to Auschwitz, and yet of course he did not lose any relatives there. But we are all one, we stand in silence as one nation and all the silly divisions between us melt away. And across from me was a young man, of whom I have written before. He is a security guard. He walks with a limp, he has had this limp since he was born. I know his father well. But today I noticed something. As he stood opposite me in silence, he stood tall, there was no sign of a limp at all. I looked more closely but all I saw was a young Jew standing tall, erect. We are all limping, after the Holocaust our entire nation is limping, but we are still moving forward, and we are standing tall once again. As I looked at this young man, a man born with a limp, standing tall for these two minutes, I see in him a symbol of all we are as a nation, a people. We were hit hard, we were left for dead, but we stood up, we still have a limp, we still walk with pain but we are standing tall and moving forward. He stood opposite me with no sign of the limp, not now, not today, today we stand tall. For a moment I smiled, strange on a day like today, on a moment like that moment, but I smiled because we are standing tall, in Israel. And I think of little Gavriella, the one who is in heaven and the new one here in Israel, and I say, we stand tall for you. Today we all stand tall. The nation of Israel lives.